WOW! 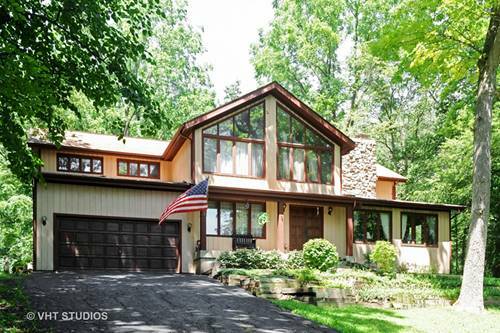 Expansive, bright + sunny home on 1.9 wooded acres that you can customize to your liking! Built to last w/impressive architecture and today's modern features, you will love the natural light that pours into this home from all sides! Picture yourself cooking and entertaining in the huge, eat-in kitchen with a charming bench seat, large center 8' x 8' butcher block island, and big pantry! Store all your gear in the extended laundry/mud room off the garage, and relax in the family room with volume ceilings, built-ins and cozy, 2-sided fireplace. Retreat upstairs to 2 generous secondary bedrooms, a loft with built in bookshelves and the master suite complete with luxury master bath and huge walk-in closet. In the full finished basement you find a nice rec room with a wet bar, 2 more huge bedrooms and a full bath! Play outside on the big, freshly painted deck and enjoy nature. Part of the award-winning St. Charles School District 303, this home is a diamond in the rough! For more information about 40W460 Winchester, St. Charles, IL 60175 contact Urban Real Estate.